If you’ve ever worked for a startup or tech company, or know someone who has, or are interested in the world of app developers and Silicon Alley and raising venture money, then Startup by Doree Shafrir is for you. It’s a pretty light read, so don’t expect anything heavy or revolutionary. But it’s entertaining. Mack McAllister is the CEO of a mindfulness app called TakeOff, based in New York City. He’s living a good life – lots of women, a successful app, hundreds of likes on his Instagram posts within minutes of putting them up. But he’s at a bit of an inflection point. He’s become increasingly emotionally attached to his head of marketing, Isabel, and he needs to raise another big round of venture capital to move TakeOff to the next level. Meanwhile, Katya Pasternak, a reporter at a tech website, is in search of a scoop. She’s getting pressure to land a big story that will bring in more than just clicks, but also glory for both herself and her employer. She’s smelling something amiss at TakeOff, and when an errant NSFW text message from Mack shows up on Isabel’s phone when Katya and Isabel are at the same party, she can’t resist pursuing the story. I found a lot of Startup to be pretty familiar – the social media apps, the techspeak, the startup culture, the exhausted working parents – which I loved. A lot of fun for me to read. I would have liked a little more focus on the development of the app, the business model, the fundraising – the substance of the startup – but the gossip-y side stuff was fun too. In the wake of Travis Kalanick’s resignation from Uber yesterday, Startup‘s focus on CEO misbehavior was certainly timely. Mack is no Travis, and TakeOff is no Uber, but still. 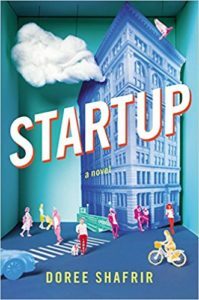 Shafrir’s writing is sharp, observant and funny, and Startup was a quick and enjoyable read for me. If you’ve gotten to the end of this review and think that you’d like it, I’d go pick it up. Posted on June 22, 2017 by gayle. This entry was posted in Fiction and tagged doree shafrir, startup. Bookmark the permalink. You summarized this beautifully and I felt the same way. It personifies summer reading- fun, not-too serious. I just felt like the ending was too abrupt- almost as if there is a movie or sequel to come. Yeah, it did end quickly. I guess that’s the pace of tech companies!